We have a love/hate relationship with our cats. Really hate is too strong of a word, we (meaning Waldo and myself) are driven nuts by them. We feel bad for them, they used to be the babies and got all the love they could absorb. They slept on our beds and us, they were always on our laps, they sat on our monitors and desks. Then Lily came into our world and the cats were just in the way. Lily sleeps in our bed so we didn’t want them even in our bedroom for fear that she would be allergic. We have loosened up on this one now that we know she’s not allergic or asthmatic, they still don’t get to sleep with us but they hang out in our room during the day. Lily is always on my lap and if she’s not for two seconds then one of the cats is trying to jump on me. Sometimes I just want my lap to be free of all sitters. They still sit on our desks sometimes but not the monitors anymore but that has nothing to do with Lily, we replaced all of our CRTs with flat panels over time. Boy you should have heard all the thumping when we got our last flat panel and Kitty kept trying to sit on it. LOL. Where does the love come in to play in this love/hate thing that I’ve been talking about. Lily is that love. She LOVES the cats. She just lights up when she sees them. She points and smiles, she talks to them and at them. We have worked for months on her being gentle with them and she is very good. She does like to poke them in the eye and ear and we sort of encourage that. They know that when they’ve had enough of her to just walk away and we want them to remember that. But let me tell you they will take a lot of Lily’s “loving” before they walk away. We have three cats as I’ve mentioned in the past and if I ask Lily where Kitty/Jingle/Tandy is she gets it right about half the time or so. And this summer I’ll be very glad we still have them, they are great at keeping the bug and spider population in check. So I guess they deserve a little love for that alone. I have to admit that Lily’s love for them is so sweet that I will happily take the annoyance. I just hope for all of our sakes she continues to think they are pretty darn cool. What sweet, sweet photos! I know what you mean, Jinxy! 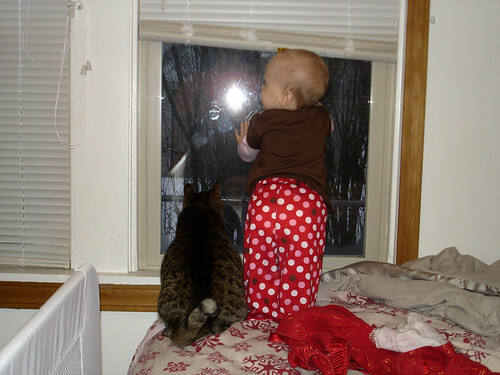 We had two indoor cats and they were our babies too before Little One came into our lives. It seems wrong of us to get annoyed when they just want our attention and love too. 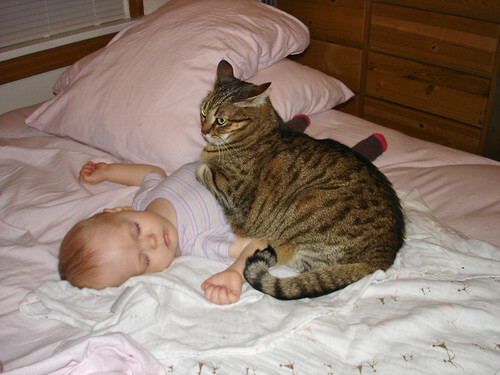 We actually had to make our house cats into barn cats because it got to the point where they would lay on top of Little One’s head or on top of her tummy. I was so afraid they would smother her. She still gets to play with them when we’re outside and she loves the animals on our farm. I sometimes feel sad that we had to make them barn cats. OMG the last photo is just darling. Totally makes me smile!